Try to discuss the idea of "settling space" with the average person on the street, and you may get some strange reactions. But concept is not as far-fetched as you might think. Elon Musk, founder of SpaceX (one of most well-known privately owned space companies) and co-founder of PayPal, has said he would like to see 80,000 people per year making the one-way trip to colonize Mars. In fact, he would like to retire there himself. But for some, the concept of space settlement, sometimes referred to as space colonization, evokes images of the 1800's "Old West" in America, where lone adventurers and settler families in wagon trains headed into the wilderness looking for a better life. To others, the plight of the Native American Indians, displaced from their lands by waves of greedy invaders, comes to mind. Those with knowledge of world history may recall other efforts at settling new territory, from colonization of the Mediterranean by ancient Greeks, to European settlement of Australia by Europeans in modern times. And fans of science fiction may envision cities on the Moon, Mars, or elsewhere in space, habitations in orbit around the Earth, or even settlements on the planets of nearby stars. So if your listener hasn't given it much thought, as most people haven't, the space settlement concept may seem like a fringe or "far-out" idea. Long-running TV series such as Star Trek and its derivatives, movies like Star Wars, and of course the many popular science fiction novels published since the early years of the 20th century have helped unlock our imaginations to what the future could hold, but this has been a double-edged sword. The mix of fantasy and invention in the portrayal of humanity's destiny in space creates a sense of unreality. When predicting the future, anything is "unreal" in the sense it hasn't yet happened. In the case of colonies in space, the predictions have not only been laced with liberal doses of fantasy, but the manner they are portrayed gives the impression the events are situated in the distant future ("in a galaxy far, far away"), and not necessarily something within our reach right now. With a mental image of either the American West and the European settlement efforts of the 19th century or of the far-flung science fiction/fantasy of the Star Wars movies, it is no wonder many people don't consider space settlement a serious topic for discussion. It doesn't seem to have importance to their own lives, since the colonization on Earth that they've heard about stopped long ago, and the colonization in space they've seen or read about is somewhere in the far, imagined future. In reality, however, the gap between science fiction and science fact is narrower than you might realize. The past may be out of reach, but the so-called "distant future" is not necessarily as remote as most people assume. 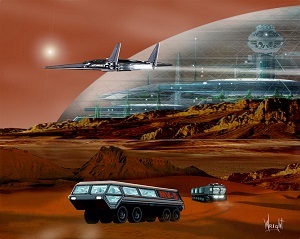 What would a real space settlement look like? It need not consist of a fleet of roaming interstellar colony ships, as depicted in the 1970's show Battlestar Galactica. A space settlement doesn't mean a distant planet where every square inch of land is covered with man-made structures, like the planet Trantor in Asimov's Foundation novels. A space settlement might simply be a small city on the Moon or Mars. 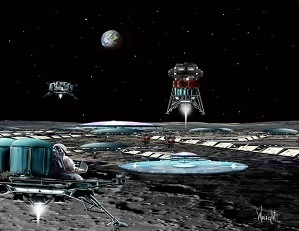 The city could be built to support the activity of a bustling Lunar or Mars base. Such a base could be founded by private entrepreneurs hoping to make their fortunes through Lunar or Martian real estate speculation, space hotels and tourism, harvesting and transmission of solar energy, or other such space-based businesses. The idea of settling space is not that complicated or "far out." And while there are echos in space settlement of the European colonization efforts of the 1800's and earlier, the essentials are obviously quite different, including the important point that space is uninhabited. There are no indigenous peoples in space who stand to lose their land, cities, hunting grounds, or their lives when we establish a permanent presence there. We live during a special time in history, a hiatus between thousands of years of human expansion on Earth and the potential of a new and greater age of expansion into the next great frontier. The settling of space is an obvious, and quite natural, next step for humankind. But it is up to us to find a way. UPDATE: The U.S. government has officially decided not to go back to the Moon. 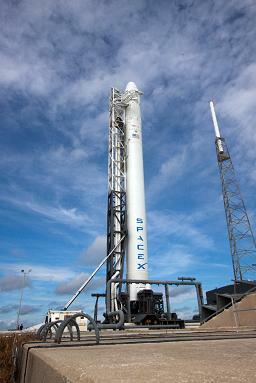 It is now up to the private sector to make space settlement happen. Congress could still give an enormous financial boost to the space settlement effort, at no cost to taxpayers, by passing Lunar Land Claims Recognition legislation.